Hi everyone! I’m on the Stamping Bella blog today sharing how I added dimension to lovely Uptown Girl Melanie the Modern Bride. You can find a complete step-by-step tutorial HERE. 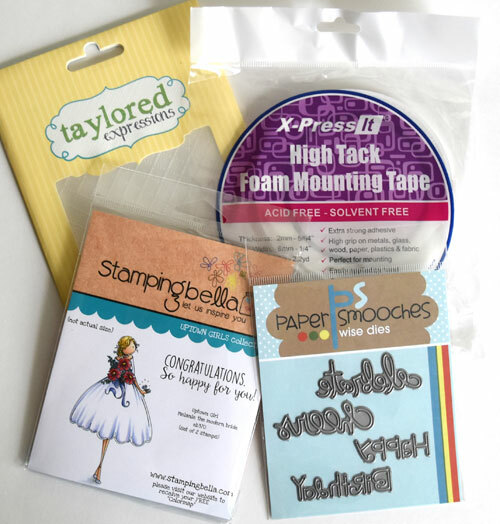 While I don’t want to duplicate the info found on the Stamping Bella blog, I do want to talk just a bit about one of my all-time favorite crafting products, X-Press It Foam Tape . I use lots of foam tape so I *always* ensure I have a healthy supply on hand. X-Press It Foam Mounting Tape (green label) is available in 1/2″ and 3/4″ widths. High Tack Foam Mounting Tape (purple label) is available in 1/4″ and 1/2″. For paper crafting, I use them interchangeably, depending on the width called for on my project. 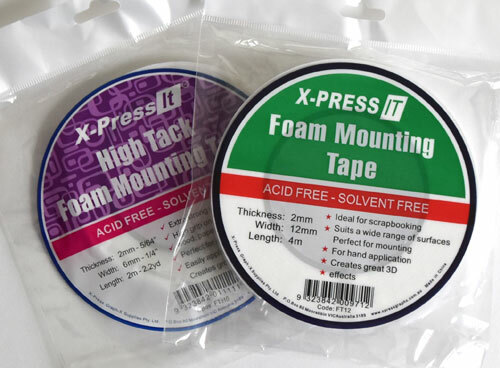 They are basically the same except that High Tack Foam Mounting Tape has an extra strong adhesive which works well on glass, wood, paper, plastics and fabric. Both are acid and solvent free and ideal for scrapbooking and card making. Three of the four products I’m giving away were used on my card today. 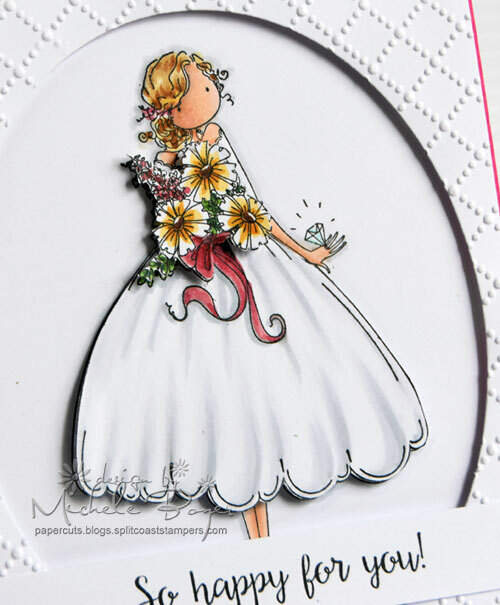 I have Stamping Bella’s Uptown Girl Melanie the Modern Bride stamp set, Taylored Expressions’ Dotted Lattice embossing folder, Paper Smooches’ Birthday Words dies and a roll of X-Press It Double-sided 1/4″ High Tack Foam Tape. Just leave a comment on this post by Tuesday, May 18, 11:59 p.m. ET. I will randomly choose a winner on Wednesday, May 19. The winner will be notified by email and I’ll post the winner’s name on my blog that day as well. I hope you’ll check out my post on the Stamping Bella blog (here) to see my card in full as well as a step-by-step tutorial for multi-layer dimension. This entry was posted in Copic, Give-aways, My Designs, Stamping Bella, Tutorials. Bookmark the permalink. 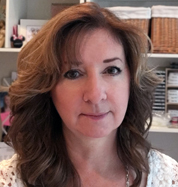 Heading to the StampingBella blog to check out your card. As always, I’m inspired by your beautiful coloring and cards!! This one is so sweet! An what a adorable giveaway. Thank you so much for the chance to win ! Your card is gorgeous! The popped-up dress looks so realistic. Hi Michele. Your card is beautiful. I am always in awe of your talent using Copics. Beautiful! Love added textures and dimension! Off to check your tutorial! Thanks Michele! Your card is so adorable. Thanks for the great directions and for a chance to win! Oh wow! What a great card! Two of my nieces are getting married this summer. I need to make a couple of these gorgeous cards! The card is gorgeous and it looks so delicate. Thank you for the inspiration! So this is the best opportunity to win and would love to play with such cute bride and sentiments die with exclusive foam tape!!! Thanks for the chance to win! I love this card. Reminds me of the days years ago when I did paper tole with silicone glue. No foam tape back in those days. Thanks for the chance to win some blog candy goodies. colouring in. Thank you also for the chance to win her. Your card is beautiful. Need to do this for a friend’s daughter is getting married in August. Love this card! Thanks for the tutorial-I’m a follower! Would love to win these products,thanks for the chance to win! WHat a gorgeous card Michele!! Owliver is so cute. I love his coloring and the heart glasses he is wearing. I got to watch 2 owls via a live owl cam in Georgia that fledged last month. It was a treat watching them. They were so cute. Except when that ate. Mom and Dad brought them some interesting food. Anyway, back to Owliver, it’s a really cute card. Michele, This is absolutely lovely. I just love the way you color! Super cute card,thanks for sharing. Michele, this is so pretty. Love the shaded folds on her dress. I haven’t tried X-Press It foam tape yet. Hope I can find it at a box craft store. But, I love all three of the other companies. Thanks for sharing. I just received some of this tape when I took the Copic Certification Courses in Calgary. I love using it! Thanks for sharing your card. You do such a great job coloring the bella’s. All your cards are lovely.